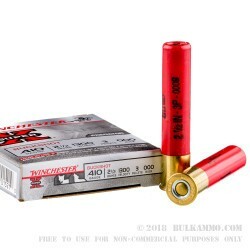 Winchester’s Super-X 410 gauge 2-1/2 inch 000 buckshot shells provide all of the reliability and consistency you have come to expect from the Super-X line of ammo, and are ideal for self and home defense. Thanks to Winchester’s one-piece hinged wad, the three 000 shot pellets reliably exhibit tight patterns with tremendous stopping power. With a muzzle velocity of 1300 fps, this buckshot is designed for maximum close-range penetration, and is a perfect choice for the Taurus Judge. 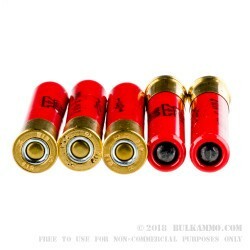 These shotshells are quite lethal to a distance of approximately 30 yards, and will punch through walls, car doors, and intruders with ease. 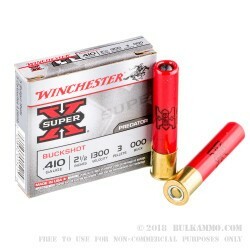 If you are looking for a lethal option to protect yourself and your home, look no further than Winchester’s Super-X 410 ga. 2-1/2” 000 buckshot shells. A: The pattern will depend on the barrel length of your Judge, but at 12 feet it should not exceed 6". The Federal 000 .410 buck will likely have a tighter pattern from a Judge than the Winchester Super-X. If you are looking for a large pattern up close, though, the Super-X is a good choice.